Round 3: *K6, yo, k2 tog, rep from*. Round 7: K2, *yo, k2 tog, k6; rep from * end last repeat k4. Begin pattern rounds above and continue as establised for 6-7 inches or desired length. NOTE: Heel is worked in rows on 24 stitches. (for 56 stitches divide for heel thus, slip 2 sts from needle #4 to #3 and from #1 to #2 slip 12 sts from needle #1 to #4 and break yarn turn work and purl one row. Row 3 Slip 1, k2, *k1, slip 1 repeat across from * until the last 2 stitches, k2. Knit in heel pattern until you have 24 heel flap rows. (or 2.5 inches for larger sock) Heel flap shape should be close to square. End with a purl row. Knit to the center of the heel. Using a spare needle, knit across the remaining heel stitches. Pick up and knit 12 (14) stitches from the side of the heel flap (Needle 1). Knit in pattern across needles 2 and 3. With needle 4 pick up and knit 12 (14)stitches from the side of the heel flap. Knit the remaining heel stitches. Stitch count is (20, 12, 12, 20)-(21, 16, 16, 21) respectively. Needle 2 and 3: Work in pattern to end of these 2 needles. Needle 4: K1, SSK, knit knit to end. Rnd 2: Work in pattern on needle 2 and 3 and st.st on needle 1 and 4. Repeat these 2 rounds until total stitches equal 48 (56) total in the round. Continue in this manner until you have approximately 20 sts. or until sock has your desired toe shape. Graft toe closed. Note: To make sure your sock isn’t too short it is a good idea to try your sock on. You can always decrease further if you wish. 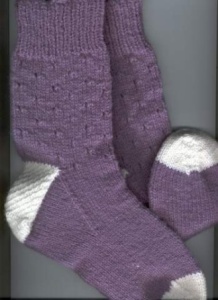 This is a easy eyelet socks and is great for the beginner sock knitter. Please respect my copyright and not post to any other list serves or website. Do not sell, but you are welcomed to download for your personal use.